I received a dispatch the other day from my friend Nick Birch, who lives in Shakespeare country. Nick operates one of England's three floating gondolas out of a boathouse in Stratford-upon-Avon. Now, I'm a novice at reading these English names, but as I understand it, "Stratford" is the town, which is "upon Avon", meaning the town sits on the edge of the Avon River. One of my favorite boatbuilders anywhere is Peter Freebody who is at Hurley-on-Thames; he lives in Hurley which is on the Thames River. each year I look forward to seeing Peter's Christmas card, which always features something miraculous, which is made of wood, and floating (see www.boatbuilder.co.uk). While England is known more for her punts and launches, there are some dedicated fans of Venetian rowing there. 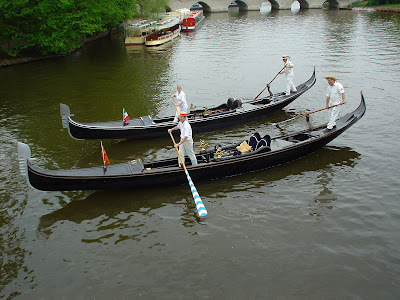 Several years ago I heard about these folks, along with rumors of various Venetian boats being rowed up and down the rivers of England. Nick's gondola, the Rosanna runs out of the boathouse at Avon Boating Limited. As with many operations in seasonal areas, Nick is on the verge of launching the Rosanna for spring (that is if he hasn't already launched her by the time I post this). A colleague of mine last year bought one of the only other two working gondole in England that was owned by a restaurant next to a canal in Birmingham. The third gondola belonged to a cafe by a lake in a small park in London. That one was in a very sad state, but has recently been bought by another venetian rowing fan and is being restored by a boatbuilder on the Thames. Over the last two years we have built two beautiful large mascarete for colleagues. Currently in our workshops for renovation we have a mascareta and a gondolino belonging to friends. The photo above shows two of the three English gondolas. The one in the foreground is Nick's gondola, the Rosanna. I believe the other is the gondola from Birmingham. The boats look absolutely beautiful, I especially like the remi with light blue stripes, and the angel cavalli on Nick's gondola. Take a look at the registration numbers mounted on the side of the pusiol on the gondola in the background. Of course I can't help but gaze at the bridge - and fantasize about rowing that waterway one day. STEREOVIEW - Chicago 1893 "knickers"
Houston Expedition - Today's the Day! Houston Expedition Update - She's in the Water!